Get your computer off the floor. If it is sitting on the floor it will collect too much dust. Raising the computer eight inches or more will make the computer last longer and be healthier. If you have more than two people in your office, you need a network. 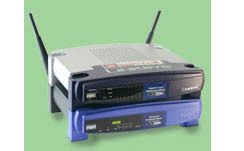 We specialize in networks of 2 to 24 computers, along with associated printers and servers. A network designed by a professional will provide optimum functionality, eliminating problems, downtime and expensive repair calls. We also offer back-up services so that your data is automatically saved at regular intervals and is stored on your server for immediate retrieval. Once the data becomes a month old, we back it up to tape drives stored off-site.